Sashiko bowl cover for my friend Michi - it's about 25cm across and took me 2 weeks to make. Over the months I've been doing it, I've come across three things that have really helped me to get good results without too much stress: leather thimbles, a 'frixion' pen and liquid starch. 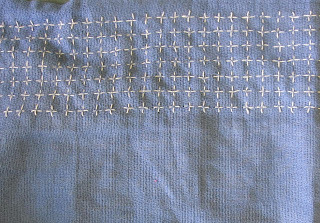 To efficiently work the tiny stitches sashiko requires, you load many stitches onto the needle before pushing it through the fabric. I was finding my fingers were getting mashed from the force that requires. I considered buying a special sashiko thimble to help with this, but that would have involved ordering online and paying a lot for postage. and a longer one to put on my middle finger to push the needle through. I've found it more comfortable to wear higher up the finger than is traditional. Each thimble is a piece of suede leather shaped a bit like a long 'u' with a tab sticking out each side at the top. I bored a hole through each of the tabs with a darning needle and threaded shirring elastic though the holes to hold leather in place. I'm really pleased with them. 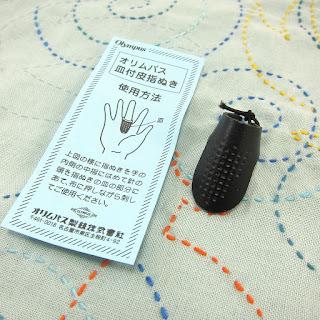 They protect my fingers well; they're flexible enough to be easy to work with; and they're tough enough that I never sew through them by mistake (an annoying thing that happens all too often with my bicycle-inner-tube thimble). Then Martin's aunty introduced me to the 'frixion' pen, an erasable pen made by Pilot which is widely available at stationery stores. It's intended to be used as a regular pen, i.e. for writing on paper. However, it works fine on fabric, too, giving sharp, clear lines that don't fade. When you want to remove them, either pop the fabric in the wash (the agitation will remove the lines) or iron it (the heat gets ride of them, too). Initially I used a blue pen, but have since moved to a black one - it shows up much more clearly on the blue fabric typically used for sashiko. 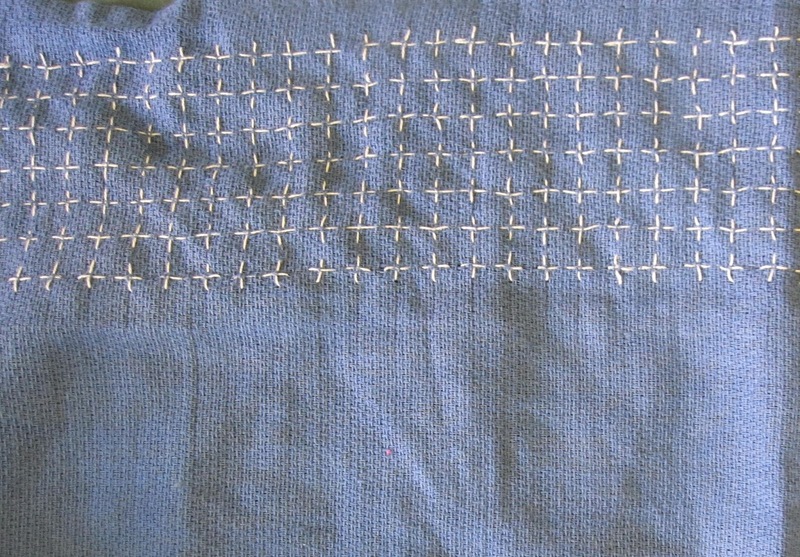 Black lines marking up blue fabric - although not for sashiko this time! I'm currently embroidering a set of fairly loose-weave tea towels for a friend's wedding. Initially, both as I was drawing my guidelines and again as I was actually sewing, the fabric flexed all over the place. It was impossible to make a genuinely geometric design in those conditions. Admittedly a simpler pattern, but still strikingly more regular! I made liquid starch from ordinary cornflour, following this recipe. Stir 1 1/2 tablespoons cornflour into 2 1/2 cups cold water. Bring to the boil with occasional stirring and boil one minute - it will become clear. Allow to cool then strain through a sieve into a container. I initially tried spraying the liquid starch onto the fabric with a spray bottle, but ended up with very uneven coverage. Putting the starch solution into a bowl, dipping the fabric in then squeezing it out was not only simpler but worked much better! Once the fabric is wetted with the starch simply iron it, taking care that you keep the weave sitting 'square' until you've ironed it fairly dry. Discard any remaining starch or store it in the fridge for up to a few weeks - it's full of good food for bugs so goes mouldy quickly!